Curcumin, present in turmeric, when combined with omega-3 fat, could potentially delay or prevent the onset of type2 diabetes, reveal researchers. The scientists from University of Newcastle’s Nutraceuticals Research Group, led by Prof. Manohar Garg, revealed that they are conducting a clinical study to find out if the Indian spice, turmeric, when combined with an omega-3 fat can actually delay the onset of type 2 diabetes or prevent its onset altogether. Speaking on this, Garg said, the root cause of Typ e 2 diabetes is systemic inflammation, which impacts insulin secretion and functioning. The aim is to nip this inflammation in the budy. The study will make use of two bioactive compounds commonly found in food, curcumin and omega-3 fat, and both are very vital anti-inflammatory agents. Derived from turmeric, curcumin forms part of ginger family, and is used as a common spice in Indian kitchen and also used for food colouration. The healing properties of turmeric are well-known in India. For centuries, turmeric has been used in healing sprains, bruises, wounds and inflammation. 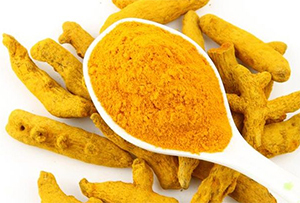 But even in India, the level of intake of curcumin has significantly reduced as Indians have switched over to westernised fast foods, and hence, there has also been considerable increase in cases of type 2 diabetes. In fact, diabetes is more like an epidemic in India now, and growing to be a major health burdern, Garg said. The randomised control trial will test both compounds, with recruitment group being segregted into four – one group with just curcumin, second with omega-3 fat only, third with curcumin and omega 3, and fourth will be the control group. Capsules containing 200mg of curcumin and 1g of omega-3 fat respectively will be given to people who are prone to develop diabetes due to impaired glucose tolerance or impaired fasting glucose, in the age group 30 to 70 years. The anti-inflammatory mechanism of curcumin and omega-3 fats are different, and hence it should be tested if they complement each other, and have treatment synergies beyond their individual effects. It is however, presumed that the combination is safe and free of any associated side-effects, and will prove to be as effective as the drugs used for management of diabetes, he pointed out. Numerous therapeutic activities have been assigned to turmerice for treatment of a great variety of disease and conditions, including skin, pulmonary and gastrointenstional systems like pains, wounds, sprains and liver disorders, since the time of Ayurveda. Over the last half century, extensive researches have proven that most of the activities associated with turmeric are due to the presence of ‘curcumin’, which has shown to exhibit anti-inflammatory, anti-oxidant, antiviral, antifungal, antibacterial and anticancer, and hence has a potential against various malignant diseases, allergies, diabetes, arthritis, Alzheimer’s disease and other chronic illness. Tumeric has been used for centuries in Ayurveda, and is believed to balance the three doshas vata, pitta and kapha. Ayurvedic practioners recommend turmeric as medicine internal in the form of fresh juice, tinctures, boiled tea, or in powdered form, and also topically used in the form of lotions, pastes, creams and ointments. Moreover, now science believes that ‘multitargeted’ therapy is better than ‘monotargeted’ therapy for most diseases, for which, curcumin is ideal. Hence curcumin is also considered to be an ideal ‘ Spice for Life’.